A fraudulent card game in Springfield in 1931 cost one of Illinois’ most prominent Republican women $50,000 – and her career. Myrtle Tanner Blacklidge (1878-1958) had been U.S. revenue collector in Chicago for two years when she visited Springfield in January 1931. Newspaper stories don’t give the reason for her visit, but Blacklidge, a niece of former Gov. John Tanner, had political contacts around the state. With more than a decade of political experience, she was a major supporter of U.S. Sen. (and former governor) Charles Deneen, who had her appointed to the collector’s post. She had been a candidate for Cook County commissioner, and Blacklidge also served as an alternate delegate to the 1928 Republican National Convention. Blacklidge would seem an unlikely victim for a con game, but her life had started to come apart in 1930, when both her husband John, a Chicago druggist, and their son, John Jr., died within two weeks of each other. “Burgess” reportedly told Blacklidge they could split some easy money by cooperating in the faro game, and the two supposedly won $207,000 in that round of cards. They were to split the winnings. However, the men refused to pay up until Blacklidge posted $50,000 cash, apparently to prove she and Burgess could have fulfilled their bets if they had lost. Blacklidge, who said she needed her winnings to pay off debts, didn’t have $50,000 of her own. So she took a train back to Chicago, where she tried unsuccessfully to borrow the money from bankers. She next turned to another prominent Republican, Edward J. Litsinger, a member of the Cook County Board of Review and 1920 Chicago mayoral candidate, and his nephew, Fred, who also worked in the tax office. Blacklidge originally told the Litsingers the cash was for a business transaction. On the train back to Springfield, however, she admitted it was a gambling deal. 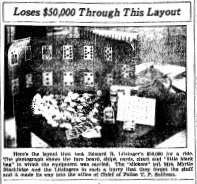 The Litsingers were to be cut in for $10,000 of Blacklidge’s winnings. Then Mrs. Blacklidge together with Fred Litsinger was escorted from the room to the lobby of the hotel by Burgess, who said he would wire New York for more money, then he disappeared. The two other men with Burgess had departed…. “When the deal was over, I realized I had been victimized,” Blacklidge said. Edward Litsinger immediately turned against Blacklidge, accusing her of being part of the confidence ring. Authorities believed Blacklidge, however, and Litsinger eventually gave up attempts to recover his money from her. Blacklidge didn’t get off scot-free. The successful fraud made headlines nationwide, thoroughly embarrassing the administration of President Herbert Hoover, and Blacklidge resigned from her tax post before she could be fired. The three con men made a successful escape, and no one was ever charged with defrauding Blacklidge and the Litsingers. In April 1931, however, a South Bend, Ind., man, George “Big” Perry, was shot to death outside his garage. It turned out that Perry’s father-in-law had been a regular card-playing partner of Blacklidge’s husband, and Blacklidge then identified photos of Perry as the man she had known as George Parker. “Now I begin to see how Parker knew so much about my family history,” she said. But Blacklidge still wasn’t done with notoriety. In 1932, she was sued by the wife of a Chicago police officer with whom Blacklidge had had an affair. (Among the evidence were what the Chicago Tribune described as “torrid love letters” addressed to the husband, “Denny Darling.”) Blacklidge was ordered to pay the estranged wife $7,500, money she again didn’t have. Blacklidge spent six months in the Cook County Jail for failure to pay. Sick and destitute, Mrs. Blacklidge entered Oak Forest (infirmary) in 1952. There she was a constant morale builder, officials said. She did intricate sewing even when her vision became impaired. She wrote for the monthly institution paper, The Optimist, and always insisted on helping other patients. More information: See Capturedandexposed.com’s entry, “Gambling With Gangsters,” by Shayne Davidson. This entry was posted in Crime and vice, Hotels & taverns, Politics. Bookmark the permalink.